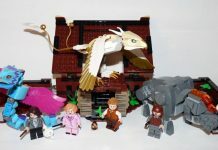 LEGO Harry Potter was a theme that began in the year 2001, with eleven sets released in the first year of the theme. The theme continued with a fluctuating number of sets until 2005. Only one LEGO set was released in the following four years, but the theme was eventually rebooted in 2010, with 10 sets and 3 polybags released between 2010 and 2011. The theme then hibernated until it was revived in 2018 under a new “Wizarding World” label, with 6 Harry Potter sets, 2 Fantastic Beasts sets, and 3 promotional sets released under the new theme. The theme includes builds from popular vehicles and scenes in the series, with the Hogwarts Express, various section of Hogwarts Castle, the Forbidden Forest with Aragog’s Lair, Hagrid’s Hut, and much more. The theme has also spawned the creation of many new pieces, including Harry Potter’s hairpiece (later used for young Anakin Skywalker in the Star Wars theme), an early style of LEGO bigfig, and a new wand element for 2018’s Wizarding World sets that replaced the old bar pieces. It also famously debuted a new midi-leg piece in the Harry Potter & Fantastic Beasts Collectable Minifigure Series. The leg piece was in between the short LEGO legs and normal LEGO legs in terms of height, but were fully poseable. This new piece was used for teenage versions of Harry, Hermione, Ron, Luna, and Neville, but have been used outside the theme by LEGO fans. Fun facts: Harry Potter was one of the earliest LEGO Licensed themes, alongside Star Wars and Spider-Man. It was therefore one of the few LEGO Licensed themes to initially use yellow minifigures before switching to skin-tone.